“At Michael's birth we learned that he had Down syndrome. Dan and I were paralyzed with fear, (which is so difficult for my children to hear me say or for them to even fathom). Michael was our 5th of eventually, 6 children and our nearest family was 800 miles away. We were not speaking to each other or the medical professionals. We leaned on our faith as that is all we felt we had, and, fortunately, Dan recalled a poem that had been read the Sunday before at Mass. We were blanketed with the assurance that God was perfectly ok with this, allowed this to happen, and would be with us along the journey. I say not only has God walked this journey with us, but he gave us so much more through the families in 21 Strong. The families in that music class together, nearly 10 years ago, had been helped so much by the families with children older than ours, we wanted to be able to do that for others and we wanted our children to have the opportunities to have friends both with and without Ds. That is why 21 Strong began. 21 Strong is not a location or an event, but, rather, simply families who come together to share, learn from each other, and celebrate. I love 21 Strong and the support each family hopefully receives and in turn, provides. It was such a safe and comforting place to grow into being the mom that Michael and my other 5 needed me to be. The thoughts shared in that music class are ones that still play through my head, bring me perspective, and I can attribute them exactly to each one of those moms. It was judgement-free, competition-free, sincere loving support. I am so grateful for the opportunity to have been part of such a beautiful group. 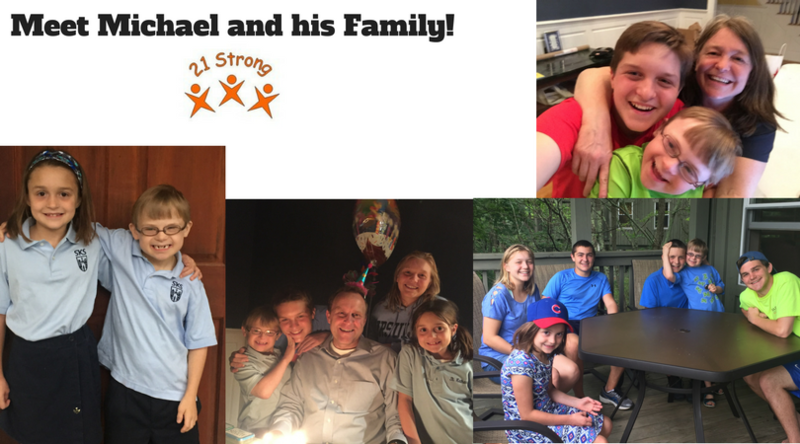 It has been a privilege to be involved in 21 Strong and I am grateful to all who participate in the activities and continue to work tirelessly to provide support for our 21 Strong families.